Macron’s Presidency: A Revolution Turned Sour? In May 2017, Emmanuel Macron, a political freshman from a newly-created, centrist party, was elected president. Today, 18 months after his quasi-revolutionary election, Macron has a shockingly-low approval rate at only 25%. His prime minister Edouard Philippe, a former member of the right-wing Les Républicains (LR), is a solid 12 points ahead in the polls. But why is Macron so unpopular? Over the years, the French have proven to set nearly impossible expectations for their heads of state. In the 2017 elections, Macron’s candidacy presented French citizens with a rare opportunity for change and centrism in France. Despite his win, his presidency thus far is defined by disapproval and controversy. However, while Macron’s new policies may seem drastic, they are essential for France’s economic and social progress after years of stagnation. When Emmanuel Macron created the centrist party “En Marche” in 2016, few believed in his potential, or dared to imagine he would be elected as the next president. Prior to launching his own party, Macron was appointed as Minister of Economy, Industry and Digital Affairs in 2014 under President Hollande. After years in the Parti Socialiste (PS), his credentials as a “centrist” were justifiably doubted. However, despite all odds, Emmanuel Macron ascended to the presidency on May 7th 2017. Dubbed the “Jupiterian president,” Macron’s overzealous and direct personality have significantly hurt his popularity. In the past, Macron has been criticized for making insensitive comments and being “out of touch” with the French people. Although he ran as the “anti-establishment” candidate, unaffiliated with the two main parties, many view Macron as part of the privileged elite simply disguised as a centrist. However, what these analyses forget is that France has no real experience with centrism. Throughout the 5th Republic, the French have consistently elected starkly left- or right-wing candidates. For the first time, France is presented with the concept of centrism, seen by Macron as the solution to France’s economic stagnation and increased societal tensions around poverty and immigration. Advocating for pro-European, environmentally-friendly policies as well as tax cuts and labour reforms, Macron’s political agenda is truly a mix of left- and right-wing ideologies. Perhaps this ambiguity in his political agenda and the lack of a firm ideological position are contributing to Macron’s difficulty in leading a stable presidency. Centrist politics aside, Macron’s presidency has been riled with controversy like virtually no leader before him. Whether it be his marriage to his high-school drama teacher or pictures he takes with young French men, Macron simply cannot win. During his campaign, theories around Macron’s sexuality emerged, with his critics arguing that his marriage to Brigitte Macron, his former drama teacher and 25 years his senior, was a cover for his homosexuality. Others, especially from the PS, questioned his legitimacy as a presidential candidate and accused him of betraying President Hollande in running against him in 2017. Now, as President, Macron seems unable to reform policies without uproar by politicians and civilians alike. Jean-Luc Mélenchon, president of the extreme-left party La France Insoumise (LFI), is one of Macron’s most loyal opponents. Mélenchon does not stray from speaking out against Macron, denouncing him as a right-wing politician hiding behind faux centrism. On the other political extreme, Marine Le Pen, leader of Rassemblement national (previously Front national), follows parallel lines of critique, accusing him of not caring for the people. 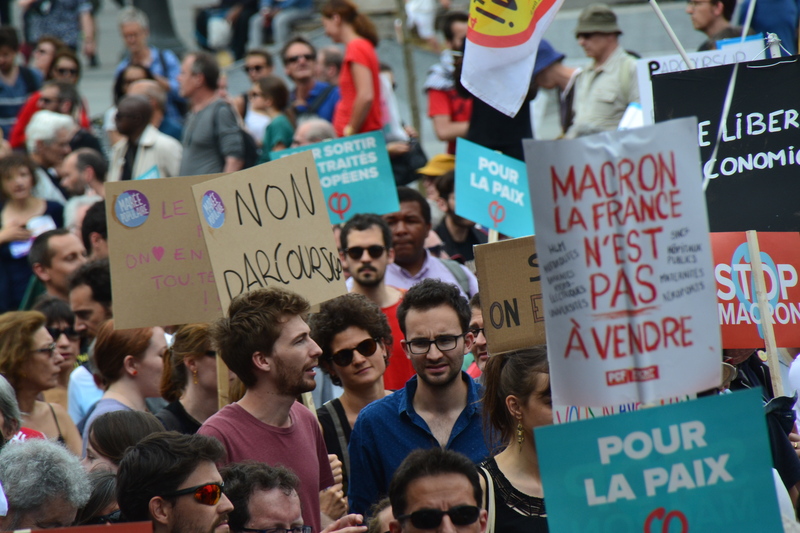 Additionally, workers and lower-income groups have not shied away from attacking the president and organizing mass protests around Macron’s labour reforms, education policy, and tax agenda. 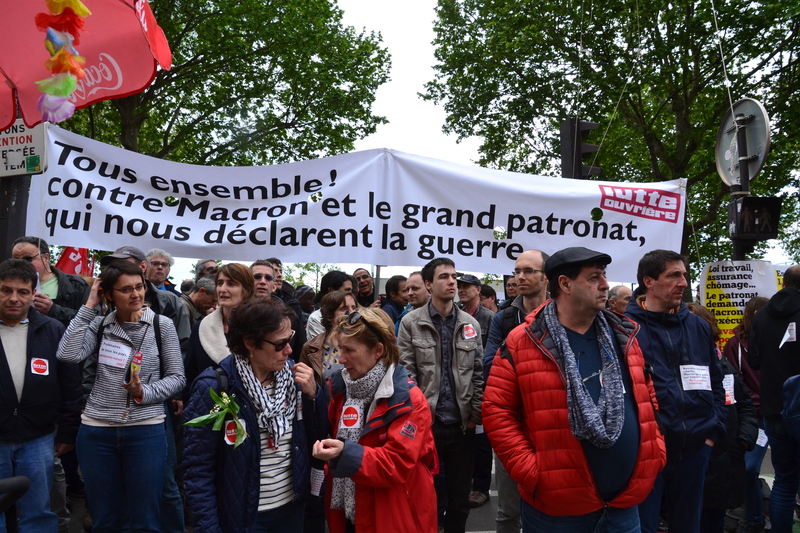 A protest against Macron in May 2018, accusing him of working with corporate bosses against the workers. In early October 2018, a cabinet shuffle seemed to signal a full-fledged crisis in Macron’s government, following a lengthy and drama-filled summer that was marked by the Benalla Affair. On May 1st 2018, a uniformed man was filmed attacking two protestors in Paris. The man turned out to be Alexandre Benalla, one of the Elysée’s bodyguards. Benalla was on duty as an observer, but was fully equipped as a police officer. Macron’s cabinet proceeded by suspending the bodyguard for two weeks in May, with the incident still unbeknownst to the public. On July 18th, the scandal went public and dominated French news for the rest of the summer. As coverage ensued, the alleged cover-up became viewed by the public as a political tactic by Macron and his cabinet to purposely deceive the people. Macron himself was in Australia when the incident occurred but was nonetheless judged directly responsible for Benalla’s overstep. While Benalla’s violent actions must not be defended, twisting an individual’s inappropriate behaviour as a way to delegitimise Macron exemplifies the recent strategy of political instrumentalism against the President. The Benalla affair was quickly replaced in the media by public outrage surrounding a new diesel tax. 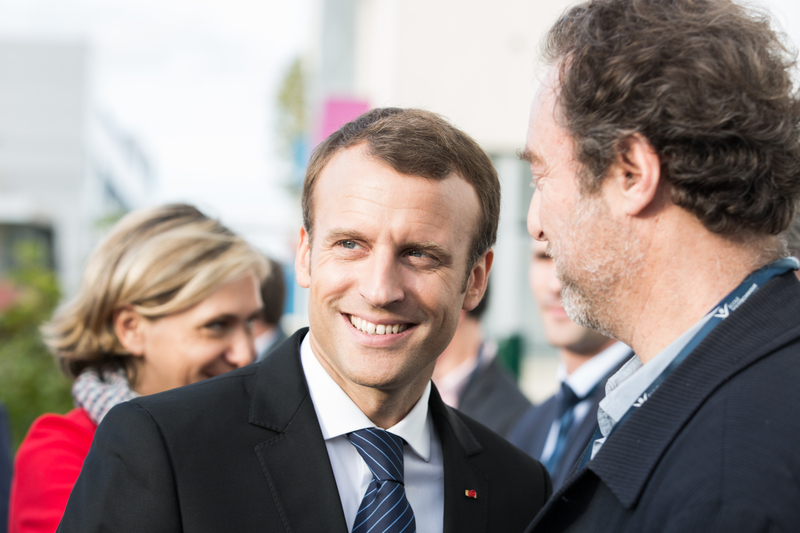 In late October 2018, Macron and Philippe’s government announced a new ecological fiscal plan, in line with the president’s outspoken commitment to climate change. The plan outlined an increase in taxes on fuel – specifically diesel. Since January 2018, the price of fuel in France has also risen from 1.46€ to 1.57€ in October. These events, interpreted as an attempt by Macron to steal the people’s money, have led to widespread outrage among the French. However, ignored in this opposition is the government’s promise of a 4000€ premium for citizens to replace their diesel-based cars. After the 1997 Kyoto Protocol, diesel was promoted as a more sustainable, environmentally friendly carburant than petrol and was adopted by various European governments in an attempt to reduce CO2 emissions. Until 2017, diesel represented at least half of the market share of carburants in France. However, information released in 2015 unveiled the significant environmental damages caused by the widespread use of diesel. Thus, in his promise to combat climate change, Macron is now targeting the use of diesel in the country. Nonetheless, rage has spread throughout the country. A large-scale protest against the new tax plan led by the “gilets jaunes” (“yellow jackets”) for November 17th resulted in 1 death and over 400 injured civilians. In this process, the diesel tax is falsely reduced to a tactic to hurt citizens’ purchasing power and waste their money. Blinded by their anger towards Macron for “not listening to his people,” the French are ignorant to the importance of such a diesel tax. This tax will do its part in reducing citizens’ impact on the environment, will give France more financial resources to invest in renewable energies, and could stimulate the economy in the long run. With Macron, the French are hearing something strange, mysterious and unknown to them: optimism. Macron’s speeches, plans and reforms illustrate his belief that France can actually progress and change for the better. Facing him, however, is a population that is overcome with paranoia about losing their money and their voice, and which no longer views the government and the president as their allies. Macron is indubitably proud of his country; of its history, its culture, and its potential. His presidency, so far, has been marked by his attempts to revitalize France as a major political powerhouse that remains strong today in the face of rising nationalism, fear mongering and Euro-scepticism within the continent and around the world. Back in October 2017, when Macron’s popularity hadn’t yet taken major hits. Macron wishes to focus on France’s strengths in education and culture. As a philosophy and history buff, Macron frequently emphasizes the cultural impact France has had on the world. His speeches demonstrate an eloquence and intellectualism particular to France, one that is incomparable to many other world leaders today. Even still, the French seem unhappy. His vocabulary choices and cultural references in his speeches are regularly scrutinized for being “elitist” and “snobbish,” and are twisted by his opponents in an attempt to prove that he is out of touch with the people he represents. With nationalists in Italy, Hungary, and Poland, and with the finalization of Brexit, the EU has never been so fragile. Macron campaigned on a pro-European platform and remains a staunch advocate for the maintenance and strengthening of the EU. With Merkel stepping down as leader of the CDU, the future of the EU rests partly on Macron’s ability to unite Europe in the face of instability and unrest. Macron’s popularity hit an all time low with a 25% approval rate after the “gilets jaunes” demonstration. With the European elections coming up quickly, the success of Macron’s La République en Marche (LaREM) candidates will be telling of the next three years of his presidency, as well as his chances for re-election in 2022. Macron deserves higher than 25% approval, and is given far from enough credit. With Macron, France has developed a more attractive image internationally, is showing commitment and leadership in the fight against climate change, and is offering France the rare chance for change and progress.